Agonoxenidae is a very small family, only a few species of which occur in the eastern USA. Larvae are internal feeders on woody plants; they are unusual within Gelechioidea in having abundant secondary setae. Adults of Agonoxenidae found in North America have at least one raised scale tuft on the forewing. Blastodacna bicristatella (Fig. 1) is a native species that feeds as a larva inside fruits of hawthorn, Crataegus sp. (Rosaceae). Larvae can be collected by gathering fallen fruits of hawthorn in late summer. Overwintering takes place in the pupal stage, and adults emerge in May and June of the following year. 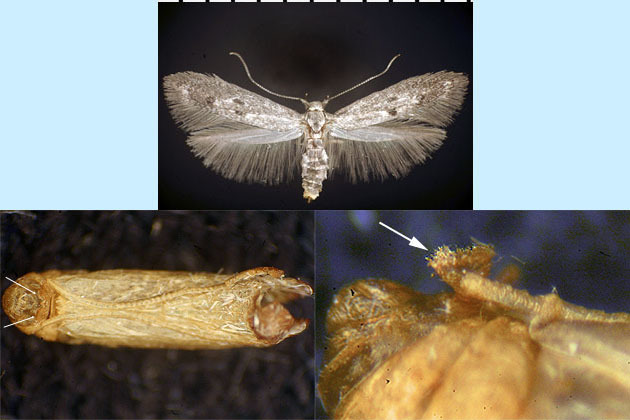 The pupa of this moth is unusual in having a pair of projecting structures (one on either side of the ventral midline near the caudal end of the pupa) that somewhat resemble larval prolegs, in that they are lined apically with small crochet-like hooks. Figure 1. Blastodacna bicristatella. Top: adult, reared from fruit of hawthorn, Crataegus sp. (Rosaceae); bottom: left, overview of pupal exuvium, ventral aspect, showing the location of the proleg-like projections (at arrows) near the caudal end of the pupa; right, closeup of pupa in left-lateral aspect, showing detail of one of the proleg-like structures. Chrysoclista (=Glyphipteryx, not to be confused with Glyphipterix in Family Glyphipterigidae) contains four described species in North America, three of which are native and occur only in the far West. Chrysoclista linneella (Fig. 2) is an introduced European species that has been collected in northeastern North America. It has not been recorded from Illinois, but it might occur in the northern part of the state (James Vargo has collected it nearby, in northern Indiana). In the USA, the larva burrows under the bark of linden, Tilia americana (Tiliaceae). The genus Chrysoclista was reviewed for North America by Koster (2002). Figure 2. Chrysoclista linneella. Top: left, spread adult; right, live adult; bottom: left, mating adults; right, pupa in crevice in bark of linden, Tilia americana (Tiliaceae). 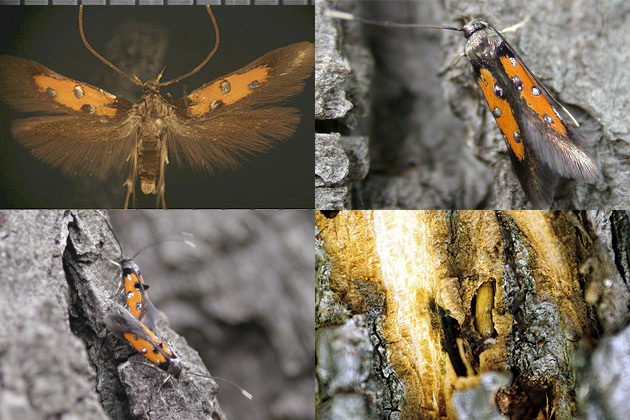 Images of live adults and pupa courtesy of Dr. Jean-François Landry.